The Life of Pi is another book I should have added to my "Books I never read because I watched the movie instead" list. It was a beautiful movie and really enjoyed the story. So, when I was given the opportunity to read Yann Martel's new book, I jumped at the chance. The book is separated into three sections: Homeless, Homeward and Home. Each part of the book tells a distinct story, which eventually comes full circle in the final pages. The first section, Homeless, is centred around Tomás, a man who has lost his way. In a span of seven days he lost everyone he loved, his father, his wife and his son to illness. Driven by his need to find himself and his faith again, Tomás sets out on a journey to find an ancient relic. His travels lead him through rural Portugal until he arrives at his destination, Tuizelo located in the High Mountains. Part two of the book, Homeward, describes the life of pathologist, Dr. Eusebio Lozora including the fateful day he meets Maria Dores Passos Castro. Maria Castro's life was intertwined with Tomás's discovery in Tuizelo. She has come down from the mountain for Dr. Lozora to perform an autopsy on her deceased husband, Rafael. The final section of the book, Home, begins fifty years later in Ottawa, Ontario. Senator Peter Tovy, having suffered the loss of his wife, decides to adopt a chimpanzee and return to his roots in The High Mountains of Portugal. It is in these pages where the story comes full circle. Oooh! Now, I get it! As you can tell from my comments above, The High Mountains of Portugal took some time to get used to and in my case...eventually understand. My first impressions weren't the greatest, but as I thought more about the story and how it wove together throughout the three parts, I started to feel a bit differently. Martel also vividly describes the main setting of the book, rural Portugal in the 1930s with such precision that it helps transport readers into believing that they're riding next to Tomás on his journey to the High Mountains. In summary, I liked the book...after I put my thoughts together. I also believe that my lack of knowledge in Portuguese culture (language, customs, etc.) may have also been a factor in my ability to enjoy the book. My advice to readers - take notes. Either that or be prepared to bookmark sections you think are important. Sounds like a lot of work, but it may help you make sense of it all at the end. If you have read the book, I'd love to hear your thoughts. Were you just as confused, or was it just me? 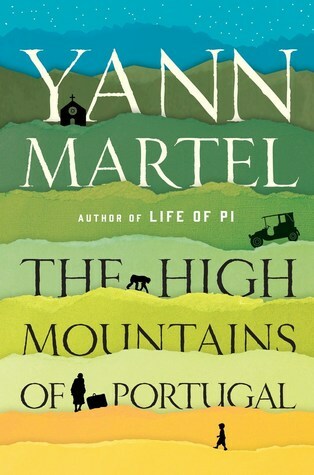 Disclaimer: I received a finished copy of The High Mountains of Portugal from Penguin Random House of Canada. All opinions are my own.